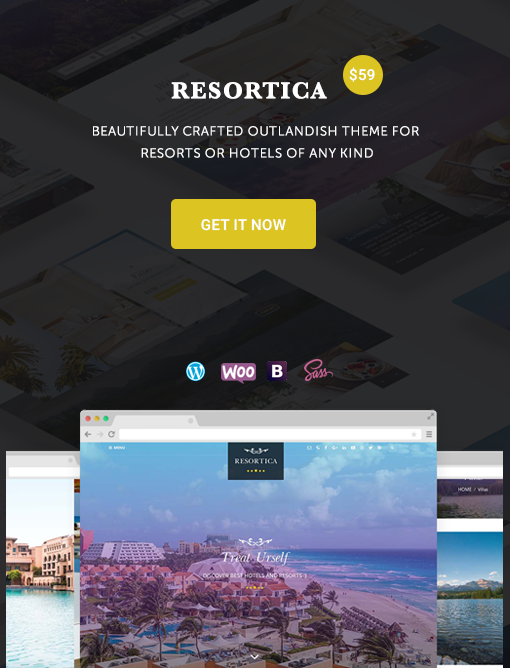 This time, I have the ultimate collection of awesome free responsive WordPress themes. If you are planning to create a website using free WordPress themes, then you have landed in the right place. All of these below-listed themes are not only awesome but also consist premium like features and functionalities. Each of them has their own specialties and components and are more worthy than some of the premium WordPress themes. 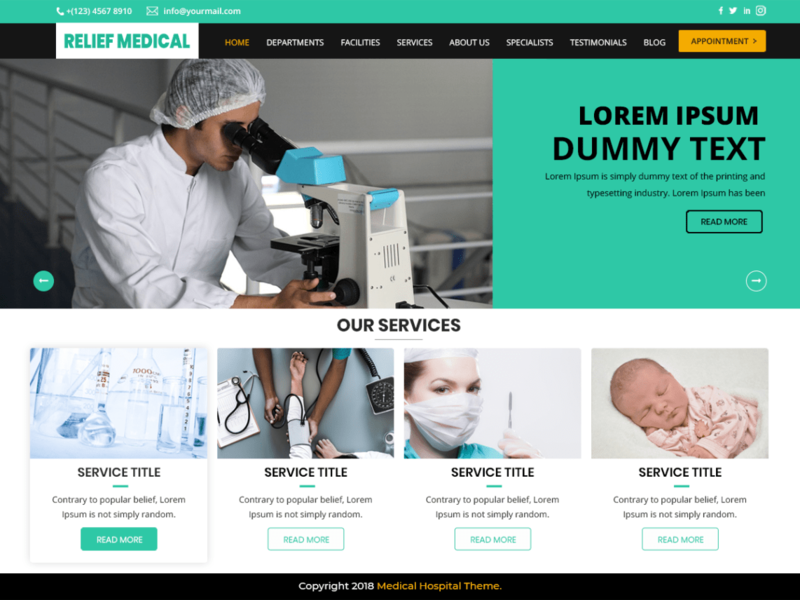 The theme creators did their job profoundly well that no users have to face tempering issues while using these free responsive WordPress themes. WordPress is one of the popular CMS platforms on the internet today. This platform is very user-friendly, flexible and comes with the intuitive framework that will take your website to the next level. 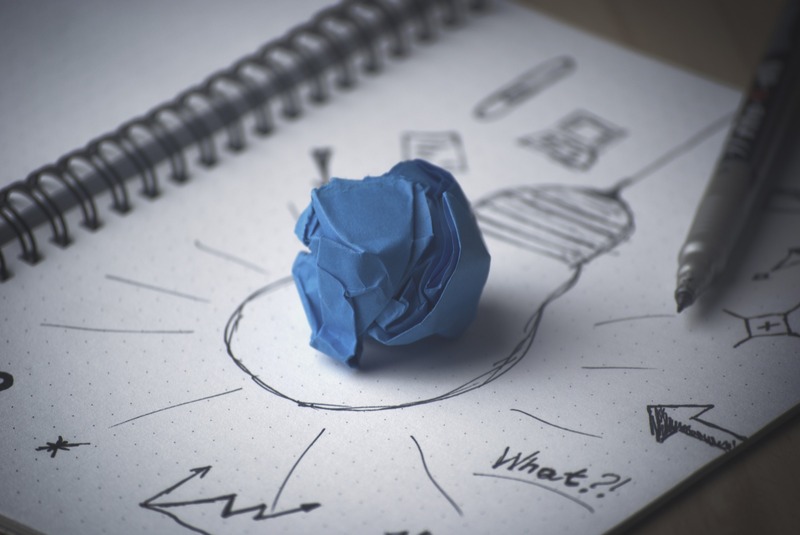 The whole customization process of the WordPress is very simple. 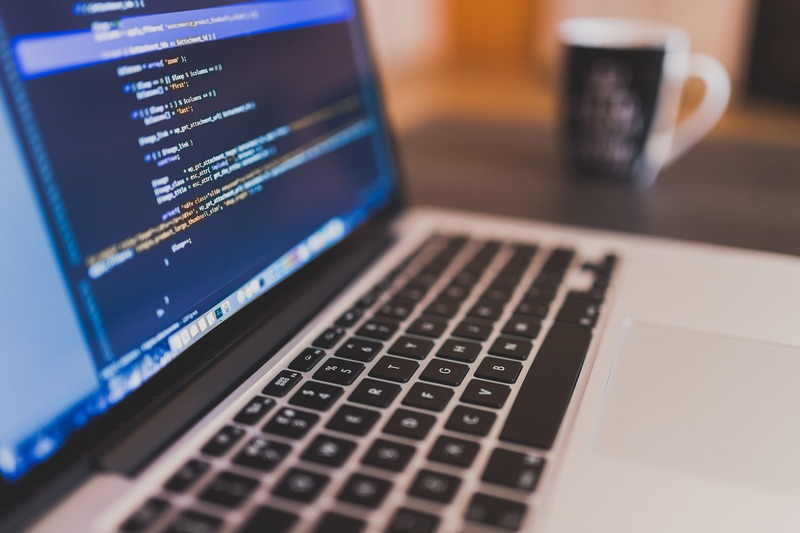 Any non-tech user can easily create a site in a matter of minutes. Not only that, there are various WordPress compatible plugins that have further heightened the position of the WordPress. Those plugins increase the functionality of your site and turn your complicated tasks into the simpler one. 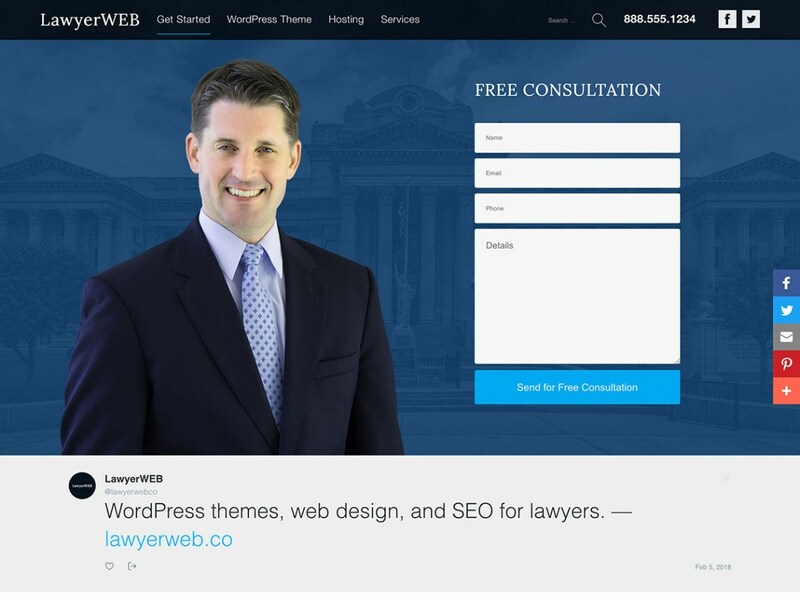 There are thousands of free and premium WordPress themes on the market, which are used to create a website. Undoubtedly, like WordPress, those WordPress powered sites are also getting huge fame in the internet world. Here are the 15+ free responsive WordPress themes for your projects. These themes are fully responsive and created with the painstaking attention to the detail. Robolist Lite is one of the best free responsive WordPress themes for directory and listing websites. The theme is ideal for listing a business agency, hotel, real state, local and global business and so on. Integrated with the WP JOB Manager Plugin, you can use this theme for job listing site as well. The plugin’s extensions will further give you tons of possibilities to create a powerful directory website. Besides that, you can use this theme as an income generating site and monetize your revenue. 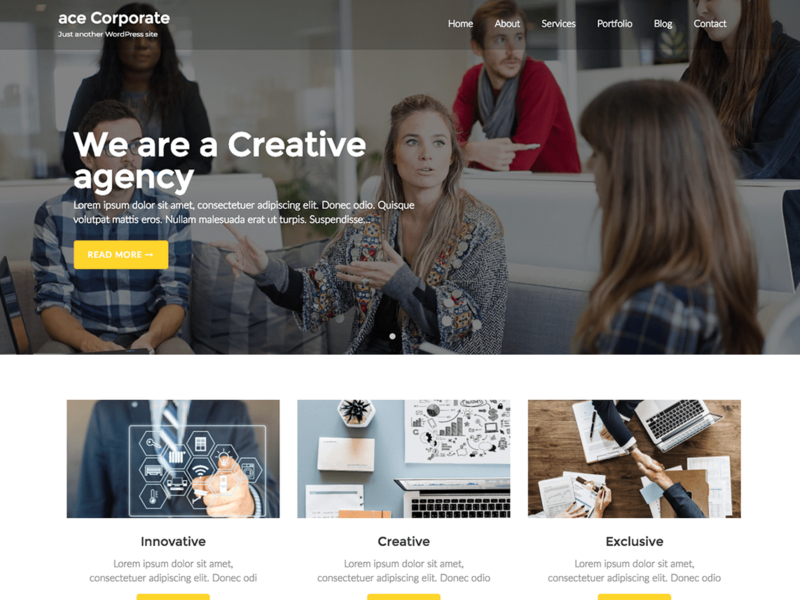 If you are looking for awe-inspiring and flexible free responsive WordPress themes then, Ace Corporate is the right choice for you. It is an ideal platform for launching Business, Corporate, portfolio, agencies, and blogging. Built in with BootStrap Framework, Ace Corporate is ultra retina friendly and works perfectly on any screen sizes and resolution. The theme comes with an array of crucial features like Testimonial Sections, Page Layout, Blog Layout, Customizable Banner Slider and much more. 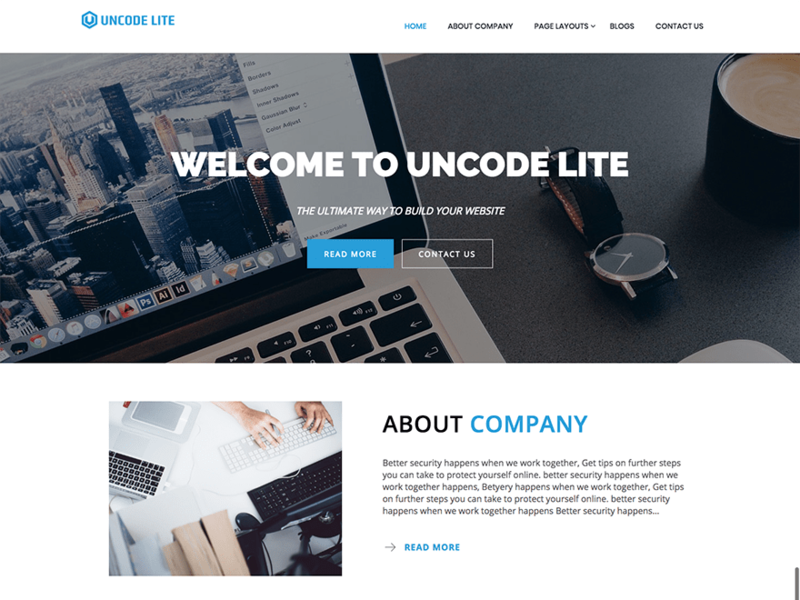 Uncode Lite is minimal and simple free responsive WordPress theme perfect for business, corporate, blogging, portfolio and so on. The theme has advanced customizer settings which lets you tweak and twist theme on your own. No coding knowledge is necessary. Uncode Lite includes features like live footer social icons link, translation ready facility, Custom CSS and so on. 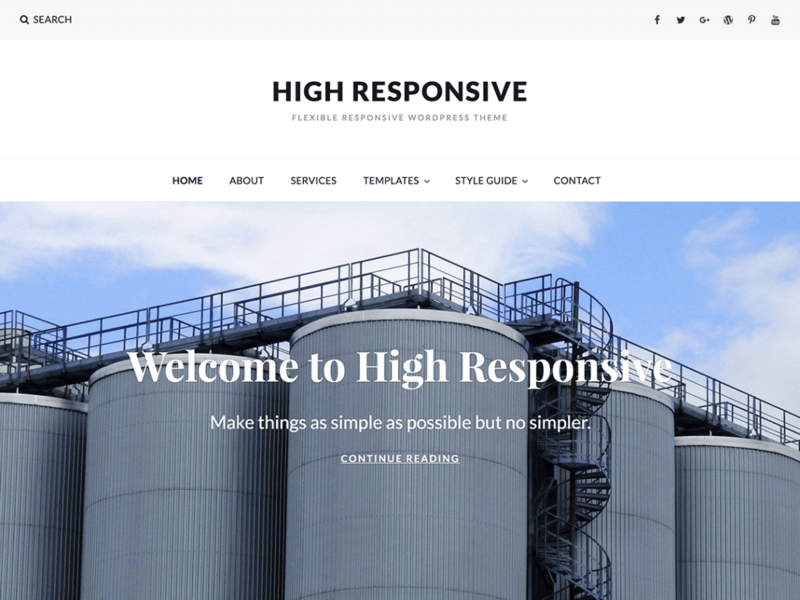 High Responsive is a multipurpose responsive WordPress theme for crafting any kind of websites. The theme has premium like features and functionalities which empowers you to launch a full-fledged website. On the top of that, High responsive has a superfine and aesthetic design that gives the first impressive look as soon as the users visit your site. It comprises feature like a featured slider, page template, dropdown menu, feeds redirect, custom background and much more. 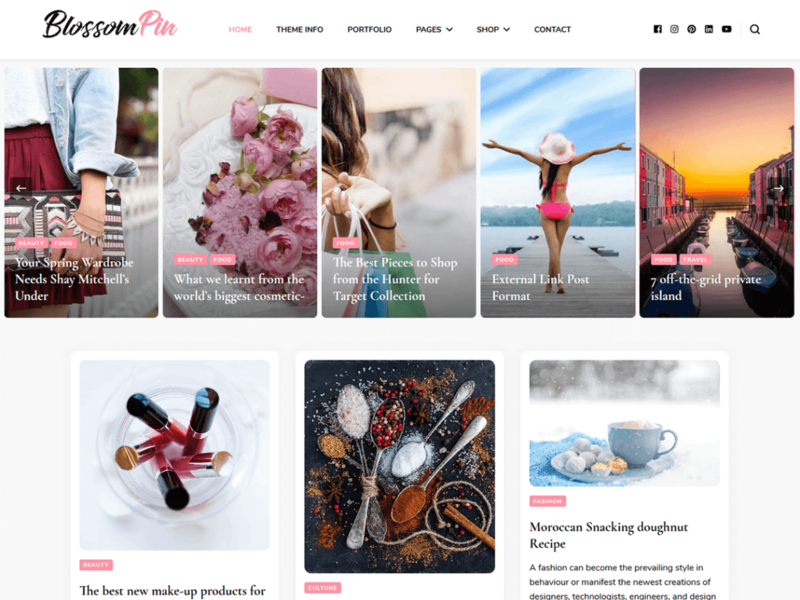 Blossom Pin is another awesome free responsive WordPress theme for blogging. If you want to share your ideas and creativity with the world them, go with Blossom Pin. The theme is perfect for fashion tips, cooking recipes or lifestyle, travel, food, beauty, wedding, portfolio, personal, girly, parenting and so on. The theme gives various typography and color scheme options, that will surely help your content stand out of crowd. 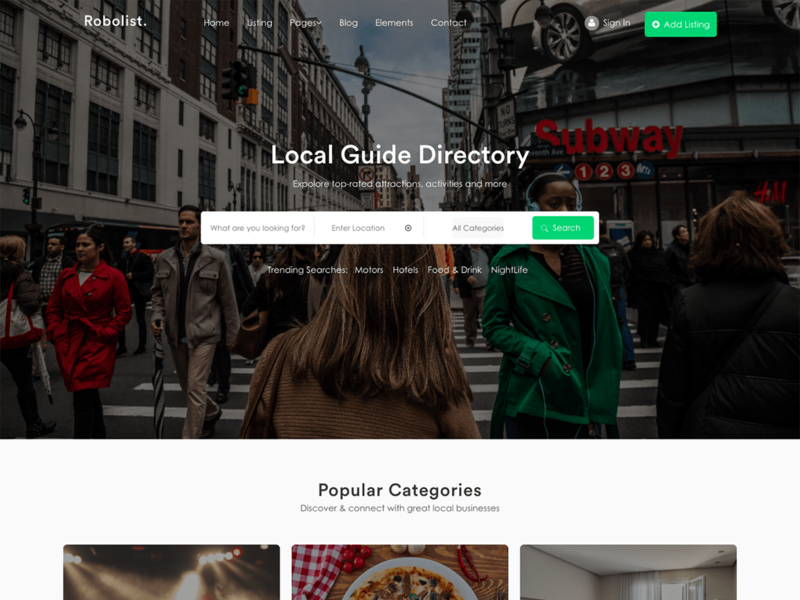 It has tons of features like Instagram Section, date format, homepage layout, banner slider layout, blog layout, banner video, sidebar option and much more. Pasal eCommerce Lite is free responsive WordPress theme for eCommerce and multipurpose website. The theme is perfect for fashion, jewelry, gadgets, watches, bookstore and so on. With the deep integration with Elementary Page Builder Plugin, you will get a plethora of elements that gives you further possibilities to create a site on your own. No need to write tempering coding as this eCommerce WordPress theme has drag and drop feature. It has a right sidebar, footer widgets, custom widgets, 4 sliders and much more. 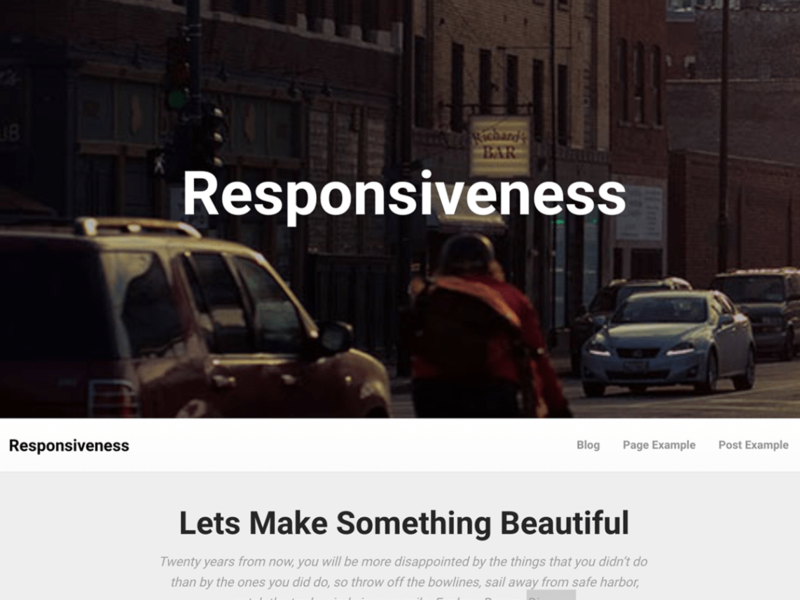 Responsiveness is one of the best and free responsive WordPress themes for blogging. The theme is also perfect for initiating news magazines, affiliate blogs, landing page, corporate business website, photography, creative portfolio, fashion or travel. It has a clean and minimalist design that showcase your creativity to the world. The theme is clean code and SEO optimized which helps to uplift the ranking position in the Google Search Engine. Not only this, the developers have given extra attention to typography, retina, which boost the writing and reading experience of the user. 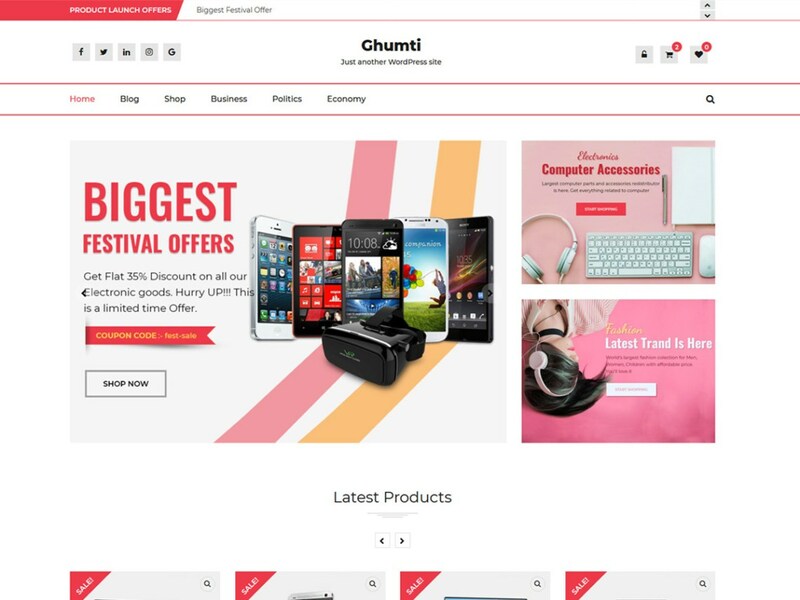 Ghumti is a free responsive WordPress theme for eCommerce or any kind of online store. It is also suitable for writing and blogging post. Built into Customizer tool, you can easily build their website in a short span of time. Ghumti is integrated with WooCommerce Plugin. This eCommerce WordPress theme has 8 Inbuilt widgets (Post Slider, Product Slider, Category Slider, Product Carousel, OnSale Slider, Social Icons, Block Posts), footer section, multi-web layout and so on. 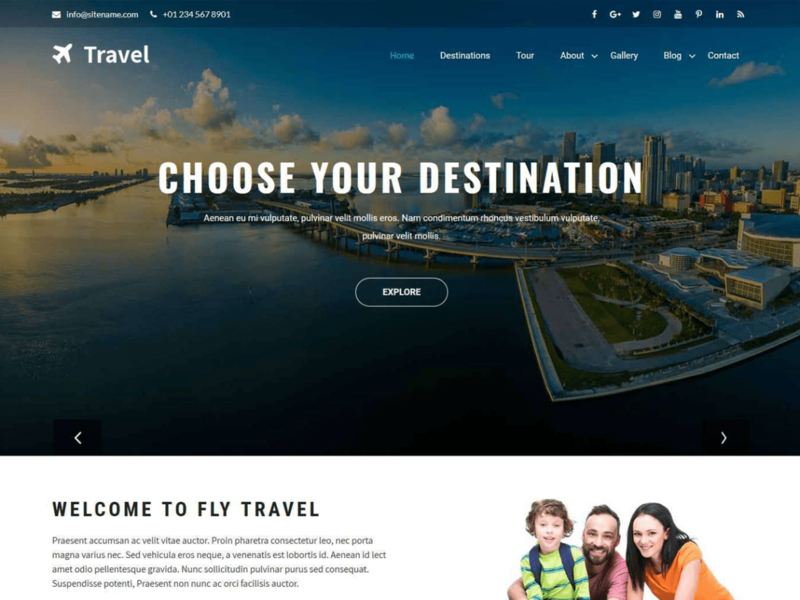 Travia is a modern and free responsive theme for travel agency, tours, hotel, resort, apartment, room reservation or any other accommodation services. The theme has advance theme option panel where you can change, add slider images, use colors fonts etc. Travia is also compatible with WooCommerce, Contact Form and other plugins. You can sell packages or services via your website. It has well-polished design and superfine interface, that grab the attention of your visitors. 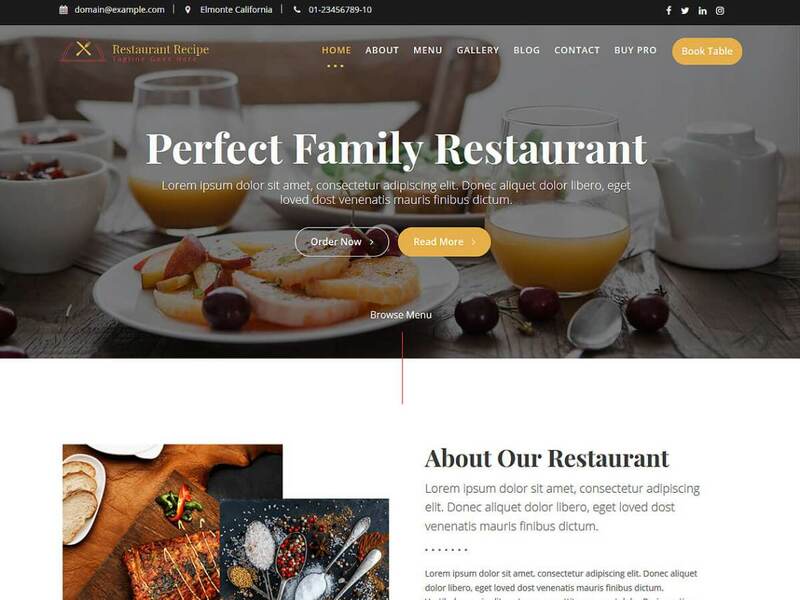 Restaurant Recipe is trendy and clean responsive WordPress themes for restaurant, cafeteria, coffee shop, bakery, sushi bars, barbecues, bars, cuisine, or any food and drink businesses. This theme works on any device and browsers. It includes all the crucial features that enable you to create a website as your preference. It is compatible with page builder plugins and comes with WordPress Live Customizer, layout controls, breadcrumb options, unlimited slider, translation ready and so on. 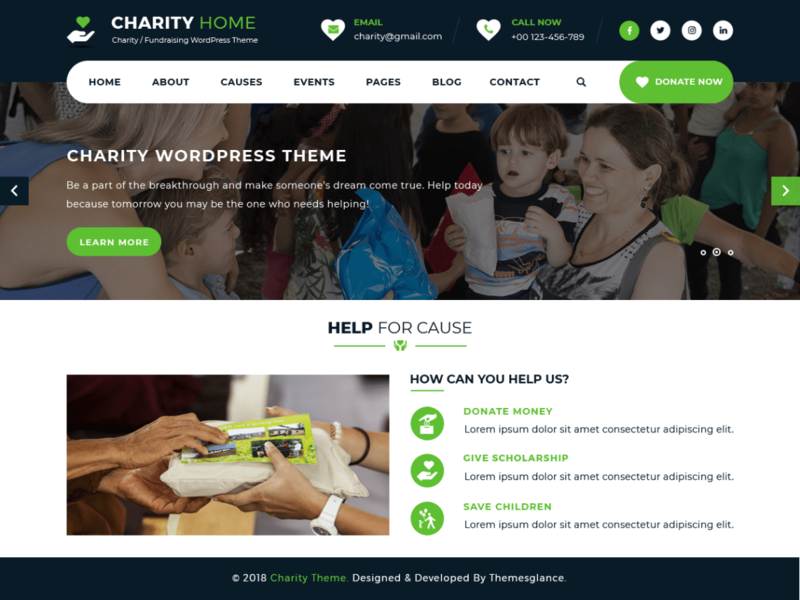 If you are looking for free responsive WordPress themes for charity then, Charity Fundraiser is the one. The theme flawlessly works for charities, non-profit organizations, NGOs and websites organizing donation camps, fundraising events and campaigns. The theme smoothly runs with third party plugin, which provides you with further extensions and functionalities. It has a highly intuitive interface and attention-grabbing design which will take your website stand out of crowd. Charity Fundraiser is cleanly coded which won’t let you face any problem while customizing the theme. The theme comes with banner options, slider options, social media icons, call to action options and much more. 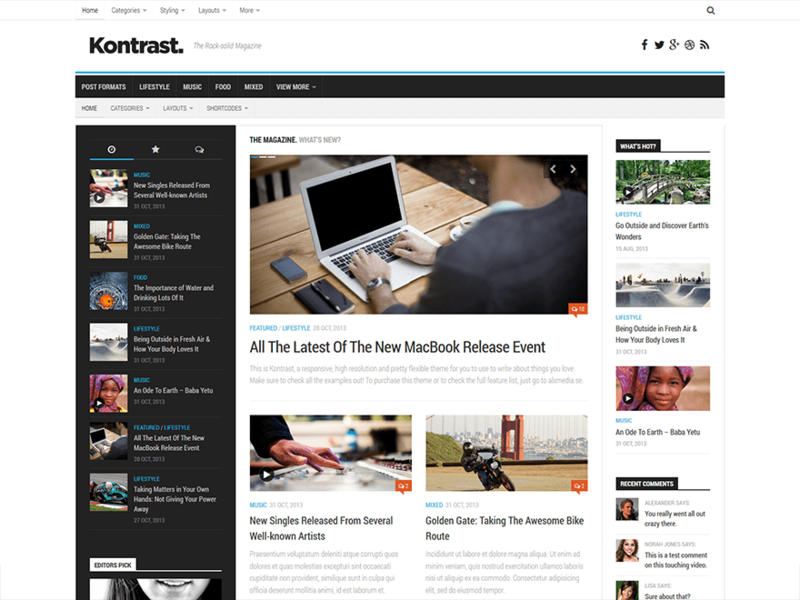 Kontrast is one of the most popular free responsive WordPress themes for blogs and magazines. It has slide-toggle sidebars which enhance the user viewing experience on any kind screen size and resolution. The theme is clean, feature rich and comes with advanced customization options that let you create a healthy website in a matter of minutes. Similarly, Kontrast contains features like 0-4 footer widget columns, 10 post formats, 2 flexible custom widgets, unlimited widget areas, social links and much more. OrionWP is a free responsive WordPress theme that can also be used for multipurpose functionality. It is ideal for travel, health, business, finance, design, magazine, art, personal and any other creative websites and blogs. The theme is fully compatible with most of the premium page builder plugins like Divi, Elementor, Visual Composer, Beaver Builder and so on. OrionWp is fully responsive and offers powerful advanced options to create a site on your own. 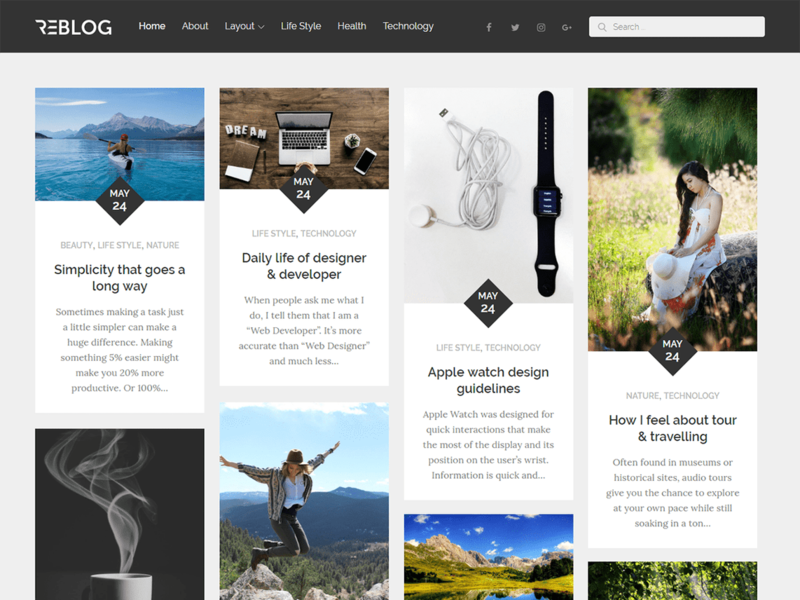 Reblog is minimalist free responsive WordPress theme for blogging. It comprises all the crucial features that are necessary to create a healthy and professional blog theme. The theme is very user-friendly and lightning-fast loading that has grid boxes layout which gives more priority to your content and showcases your creativity to the World. 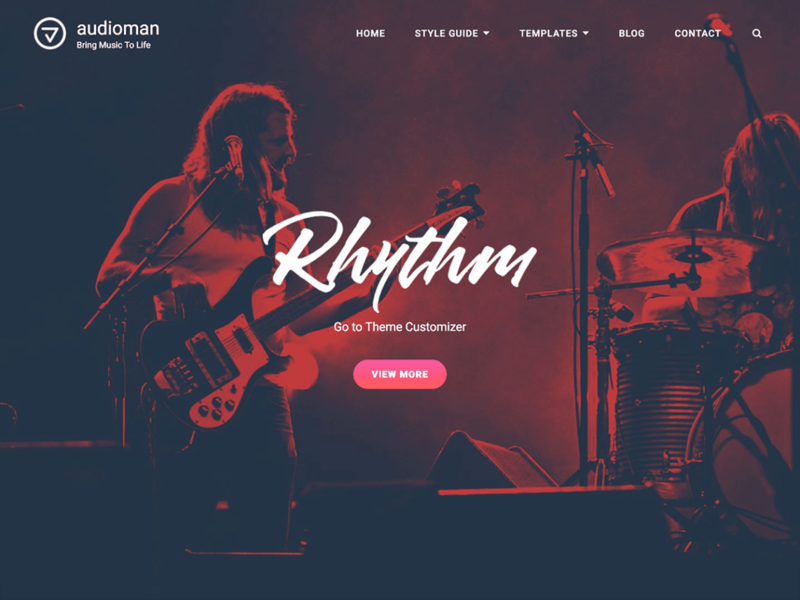 Audioman is one of the best free responsive WordPress themes for musicians and bands. This theme helps to promote your music and musical events. It comes with plenty of numbers of features that are easy to customize and craft a site on your own. No coding knowledge is necessary. Audioman is completely responsive and works perfectly on any kind of screen size and resolution. It contains features like featured slider, featured content, hero content, portfolio, testimonials and much more. 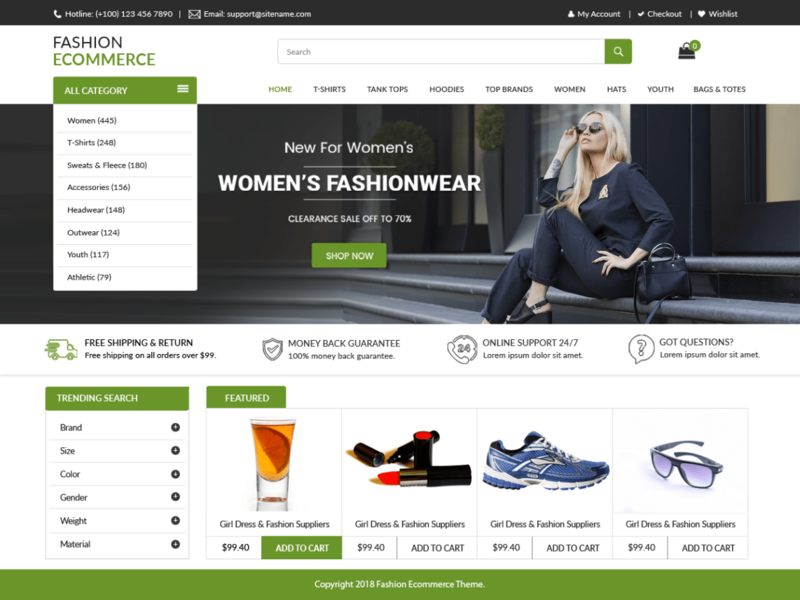 If you are looking for free responsive WordPress themes for eCommerce store then, LZ fashion eCommerce is the right choice for you. 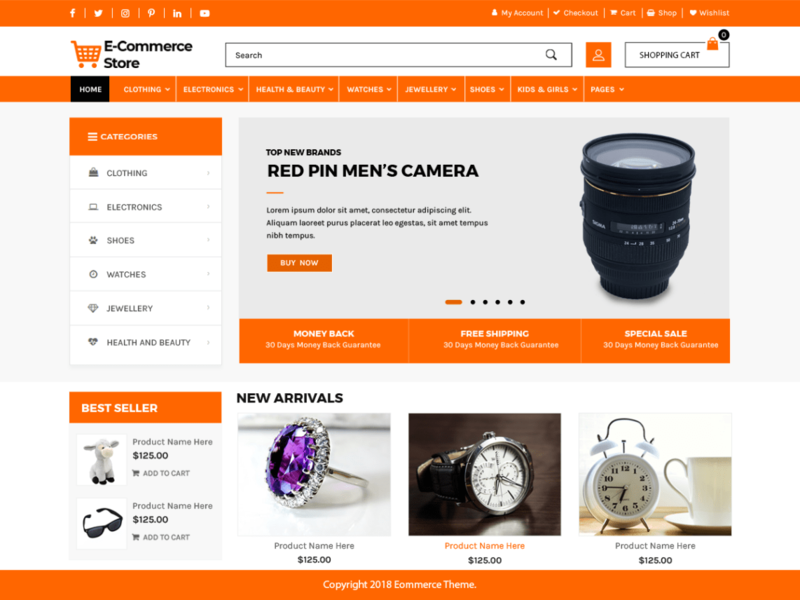 With the deep integration of the most prominent WooCommerce plugin, the theme lets you craft an online store in a matter of minutes, easily manage and sell products. 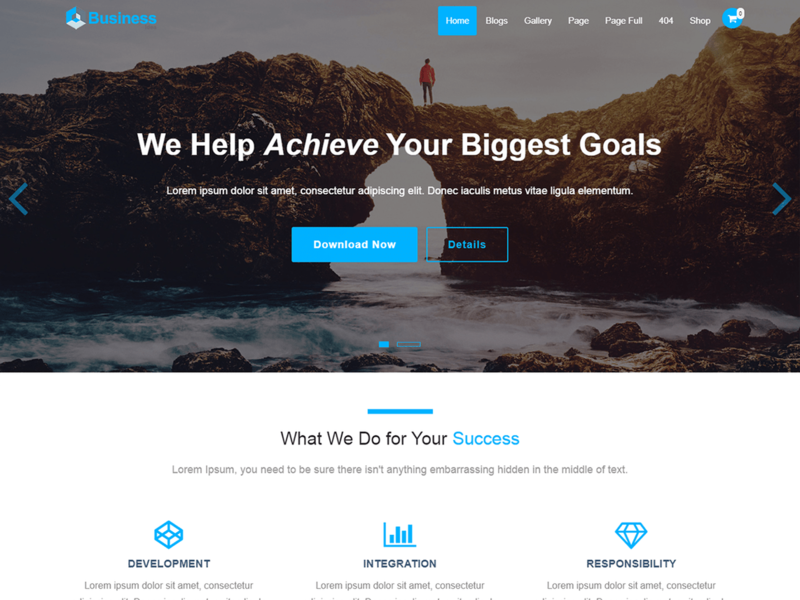 The theme comes with a handful of crucial features like slider options, boxed and full-width layout options, header and footer options and so on. Advance eCommerce Store is a free responsive WordPress theme for launching all type of online or eCommerce Store. The theme is perfect for initiating fashion, mobile, bookstore, gadgets, jewelry shop or any kind eCommerce store that sell things through the internet. On the top of that Advance eCommerce Store is also best multipurpose WordPress theme, perfect for technology, furniture, pharmacy, sports and much more. It offers a slider option which plays an important role in any eCommerce website that allows you to showcase your best deals, offers and best-selling products. The theme is fully responsive, SEO-friendly, and Cross Browser Compatible that will undoubtedly uplift your eCommerce site in Google Search Rank. Business Idea one of the best free responsive WordPress themes for crafting any kind of professional websites. With the deep integration of WooCommerce Plugin and other major Page Builder Plugin, which allows you to create a business website in a matter of minutes. It ideal platform for food, cooking, travel, photography, fashional and so on. Even though Business idea is free WordPress theme, it contains premium like features to make the website more powerful and professional. It seamlessly incorporates with Mailchimp newsletter integration, Elementor, and Beaver Builder. The theme provides homepage slider features, live customizer option panel, footer widget, subtle hover animations etc. 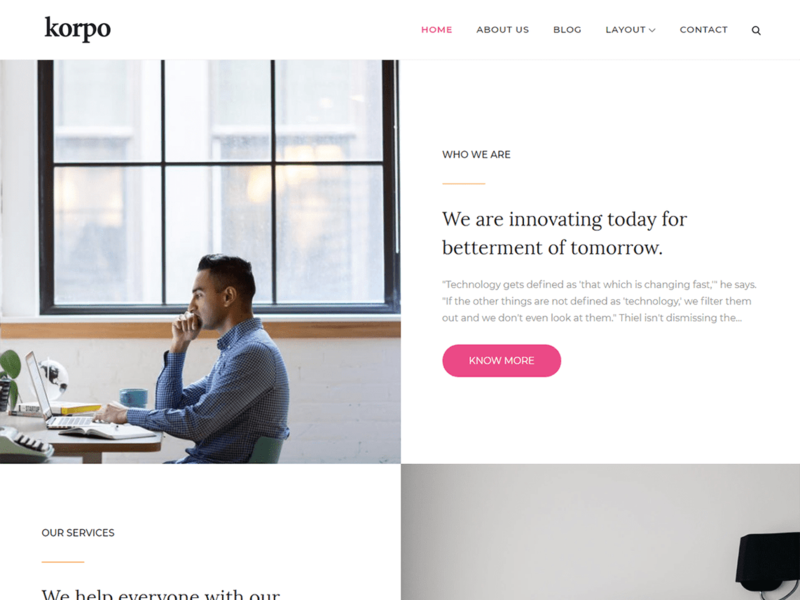 korpo is simple and free responsive WordPress theme that caters all the essential features and functionalities to create a variety of websites. Be it a personal website or corporate or business, the theme perfectly suites for all. 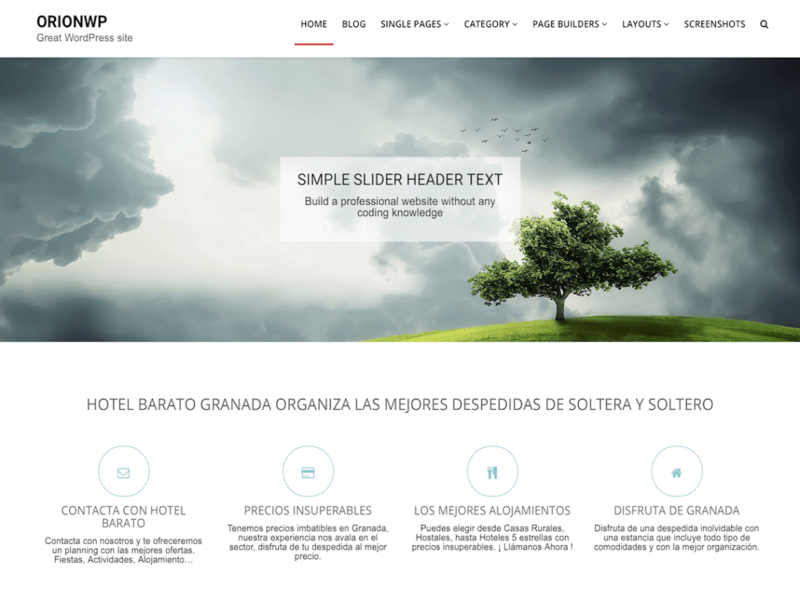 Korpo is very user-friendly, responsive and comes with tons of advanced features. No coding knowledge is necessary to set the whole theme up. The theme offers unlimited color options, different layouts with sidebar position, demo import, advance custom widgets and much more. So, these are the list of free responsive WordPress themes that take your website project into the next level. If you came across with any relevant WordPress themes, then please feel free to share in our comment section.